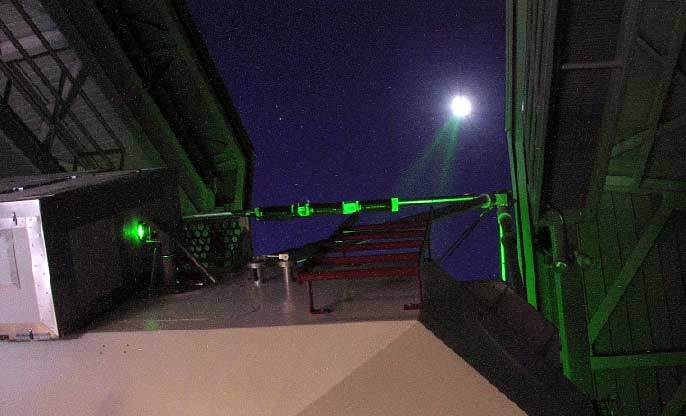 The APOLLO laser enclosure, mounted atop a telescope, sends a laser beam toward the moon. Strange events have long been linked to nights of a full moon, though careful scrutiny dispels any association. So, when signals bounced off the lunar surface returned surprisingly faint echoes on full moon nights, scientists sought an explanation in reason rather than superstition. Still, the most compelling evidence arrived during another event that once evoked irrational fears — on a night when Earth's shadow eclipsed the full moon. Tom Murphy, a physicist at UC San Diego, is among the scientists who have aimed laser beams at suitcase-sized reflectors placed on the moon by Apollo astronauts and unmanned Soviet rovers. By precisely timing the light's return to Earth, Murphy can measure the distance from here to the moon with millimeter precision. Lunar ranging, as this is called, has revealed that the moon is slowly spiraling away from us and suggested that it has a molten core. Murphy's group is using precise measurements of the changing shape of the lunar orbit to subject Einstein's theory of general relativity to the most stringent test yet. Over time, signals returned by the reflectors, faint to begin with, have faded. The project Murphy leads at Apache Point Observatory in New Mexico sends laser pulses of 100 quadrillion photons, of which, on average, a single lonely photon returns — if any at all. Earth's atmosphere nudges some photons off target so that they hit the lunar soil, and the reflectors slightly diffract the returning beam so that most miss the telescope when they return. Even after accounting for these losses, Murphy's team records ten times fewer photons than they expect. And on full moon nights it's even worse, dropping to just 1 percent of the predicted performance. Other observatories are unable to detect any returned signal on full moon nights. The team jokingly dubbed this lousy performance "the full-moon curse," Murphy says. "For a while we thought we were just victims of bad luck, but the trend continued, month after month." Murphy thinks accumulated moon dust could account for the diminished returns, which could spell bad news for plans to place telescopes up there. Although there's no wind on the moon, electrostatic forces and a constant bombardment by tiny meteorites could have kicked up some of the lunar dust to coat the surface of the clear glass prisms arrayed in each reflector. Light must pass through the surface of each prism twice — on the way in and on the way back out. A dusting that covers 50 percent of the glass would be enough to account for the dimming of the return signal they observe on most nights, Murphy calculates. But something else, something in addition to simple obscuration is needed to account for the dramatic drop on full moon nights. Murphy thinks it's heat. The prisms are sunk a bit into cylinders so that the sun only fully illuminates them when it shines straight in. Because the arrays face Earth, that only happens on full moon nights. When it does, the dark dust of the lunar regolith would heat up, setting up a thermal gradient between the surface and the depths of the prisms. That would degrade their performance by altering the refractive index, turning the prism into an unintentional lens and diverging the returning light so that even fewer photons return to the telescope. It's a beautiful idea because it generates a thing scientists probably love most: a testable prediction. If the poor performance on full moon nights resulted from heating of the surface of the cubes, turning off the light should boost the signal as soon as the surface cools so that the temperature throughout the cubes is uniform. All you'd have to do is turn off the sun. Or wait for the Earth to pass between the sun and moon, as it does during a lunar eclipse. On the night of Dec. 21, 2010, Murphy's team was fortunate to have decent observing conditions during a lunar eclipse. For five and half hours, they ranged lasers from the three Apollo reflector arrays and a fourth mounted on a Soviet rover (once thought lost for good) as the edge of Earth's shadow passed by each in turn and as they re-emerged, one by one, into full sunlight. As predicted, they saw a tenfold spike in performance as the celestial light switch was thrown, restoring the signal to levels they see on other nights, the team recently reported in the scientific journal Icarus. So why, skeptics might wonder, if moon dust is moving about, can the boot prints left by astronauts decades ago still be seen? Murphy has a calculation for that too: At the rate of deposition that must have occurred to obscure the reflectors, it would take tens of thousands of years.